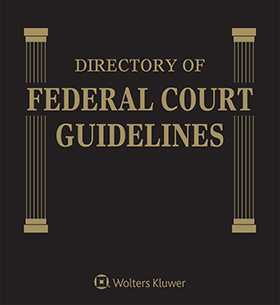 The Directory of Federal Court Guidelines outlines the requirements of over 600 federal judges in detailed form along with the procedures they mandate on such essential matters as discovery, scheduling conferences, alternative dispute resolution, voir dire, marking of exhibits, and jury participation. This is critical inside information directly from the federal courts and judges compiled and published in cooperation with the American Bar Association's Section of Litigation. You will get every sitting judge's educational background, previous experience on the bench, with the government and in private practice, and honors and awards. Many judges have provided photographs and the names and telephone numbers of their secretaries and court clerks as well. Updated three times a year, Directory of Federal Court Guidelines will prove to be a vital research tool for preparing your case.